Die Korrespondenz des Illuminatenordens. vol. 1, 1776-81, ed. Reinhard Markner, Monika Neugebauer-Wölk, Hermann Schüttler. - Tübingen, Max Niemeyer, 2005. - ISBN 3-484-10881-9. vol. 2. - Berlin, De Gruyter, 2013. - ISBN 978-3-11-029486-6. The Illuminati (plural of Latin illuminatus, "enlightened") is a name given to several groups, both real and fictitious. Historically, the name usually refers to the Bavarian Illuminati, an Enlightenment-era secret society founded on 1 May 1776. The society's goals were to oppose superstition, obscurantism, religious influence over public life and abuses of state power. "The order of the day," they wrote in their general statutes, "is to put an end to the machinations of the purveyors of injustice, to control them without dominating them." The Illuminati—along with Freemasonry and other secret societies—were outlawed through edict, by the Bavarian ruler, Charles Theodore, with the encouragement of the Roman Catholic Church, in 1784, 1785, 1787 and 1790. In the several years following, the group was vilified by conservative and religious critics who claimed that they continued underground and were responsible for the French Revolution. Adam Weishaupt (1748–1830) was a professor of Canon Law and practical philosophy at the University of Ingolstadt. He was the only non-clerical professor at an institution run by Jesuits, whose order had been dissolved in 1773. The Jesuits of Ingolstadt, however, still retained the purse strings and some power at the University, which they continued to regard as their own. Constant attempts were made to frustrate and discredit non-clerical staff, especially when course material contained anything they regarded as liberal or Protestant. 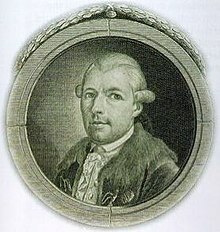 Weishaupt became deeply anti-clerical, resolving to spread the ideals of the Enlightenment (Aufklärung) through some sort of secret society of like-minded individuals. Finding Freemasonry to be expensive, and not open to his ideas, he founded his own society which was to have a gradal system based on Freemasonry, but his own agenda. His original name for the new order was Bund der Perfektibilisten, or Covenant of Perfectibility (Perfectibilists), later changing it because it sounded too strange. On 1 May 1776 Weishaupt and four students formed the Perfectibilists, taking the Owl of Minerva as their symbol. The members were to use aliases within the society. Weishaupt became Spartacus. Law students Massenhausen, Bauhof, Merz and Sutor became respectively Ajax, Agathon, Tiberius and Erasmus Roterodamus. Weishaupt later expelled Sutor for indolence. It was not until April 1778 that the order became the Illuminatenorden, or Order of Illuminati, after Weishaupt had seriously contemplated the Bee order. Massenhausen was initially the most active in expanding the society. Significantly, while studying in Munich shortly after the formation of the order, he recruited Xavier von Zwack, a former pupil of Weishaupt at the beginning of a significant administrative career. (At the time, he was in charge of the Bavarian National Lottery.) Massenhausen's enthusiasm soon became a liability in the eyes of Weishaupt, often attempting to recruit unsuitable candidates. Later, his erratic love-life made him neglectful, and as Weishaupt passed control of the Munich group to Zwack, it became clear that Massenhausen had misappropriated subscriptions and intercepted correspondence between Weishaupt and Zwack. In 1778, Massenhausen graduated and took a post outside Bavaria, taking no further interest in the order. At this time, the order had a nominal membership of twelve. During this early period, the order had three grades of Novice, Minerval, and Illuminated Minerval, of which only the Minerval grade involved a complicated ceremony. In this the candidate was given secret signs and a password. A system of mutual espionage kept Weishaupt informed of the activities and character of all his members, his favourites becoming members of the ruling council, or Areopagus. Some novices were permitted to recruit, becoming Insinuants. Christians of good character were expected, with Jews and Pagans specifically excluded, along with women, monks, and members of other secret societies. Favoured candidates were rich, docile, willing to learn, and aged 18–30. Weishaupt set Knigge the task of recruiting before he could be admitted to the higher grades of the order. Knigge accepted, on the condition that he was allowed to choose his own recruiting grounds. Many other masons found Knigge's description of the new masonic order attractive, and were enrolled in the Minerval grade of the Illuminati. Knigge appeared at this time to believe in the "Most Serene Superiors" which Weishaupt claimed to serve. His inability to articulate anything about the higher degrees of the order became increasingly embarrassing, but in delaying any help, Weishaupt gave him an extra task. Provided with material by Weishaupt, Knigge now produced pamphlets outlining the activities of the outlawed Jesuits, purporting to show how they continued to thrive and recruit, especially in Bavaria. 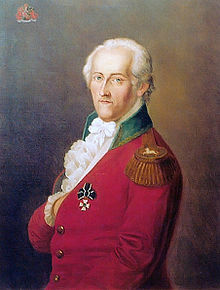 Meanwhile, Knigge's inability to give his recruits any satisfactory response to questions regarding the higher grades was making his position untenable, and he wrote to Weishaupt to this effect. In January 1781, faced with the prospect of losing Knigge and his masonic recruits, Weishaupt finally confessed that his superiors and the supposed antiquity of the order were fictions, and the higher degrees had yet to be written. If Knigge had expected to learn the promised deep secrets of Freemasonry in the higher degrees of the Illuminati, he was surprisingly calm about Weishaupt's revelation. Weishaupt promised Knigge a free hand in the creation of the higher degrees, and also promised to send him his own notes. For his own part, Knigge welcomed the opportunity to use the order as a vehicle for his own ideas. His new approach would, he claimed, make the Illuminati more attractive to prospective members in the Protestant kingdoms of Germany. In November of 1781 the Areopagus advanced Knigge 50 florins to travel to Bavaria, which he did via Swabia and Franconia, meeting and enjoying the hospitality of other Illuminati on his journey. The Rite of Strict Observance was now in a critical state. Its nominal leader was Prince Carl of Södermanland (later Charles XIII of Sweden), openly suspected of trying to absorb the rite into the Swedish Rite, which he already controlled. The German lodges looked for leadership to Duke Ferdinand of Brunswick-Wolfenbüttel. Suspicion turned to open contempt when it transpired that Carl regarded the Stuart heir as the true Grand Master, and the lodges of the Strict Observance all but ignored their Grand Master. This impasse led to the Convent of Wilhelmsbad. Knigge's first efforts at an alliance with the intact German Grand Lodges failed, but Weishaupt persisted. He proposed a new federation where all of the German lodges would practice an agreed, unified system in the essential three degrees of Freemasonry, and be left to their own devices as to which, if any, system of higher degrees they wished to pursue. This would be a federation of Grand Lodges, and members would be free to visit any of the "blue" lodges, in any jurisdiction. All lodge masters would be elected, and no fees would be paid to any central authority whatsoever. Groups of lodges would be subject to a "Scottish Directorate", composed of members delegated by lodges, to audit finances, settle disputes, and authorise new lodges. These in turn would elect Provincial Directorates, who would elect inspectors, who would elect the national director. This system would correct the current imbalance in German Freemasonry, where masonic ideals of equality were preserved only in the lower three "symbolic" degrees. The various systems of higher degrees were dominated by the elite who could afford researches in alchemy and mysticism. To Weishaupt and Knigge, the proposed federation was also a vehicle to propagate Illuminism throughout German Freemasonry. Their intention was to use their new federation, with its emphasis on the fundamental degrees, to remove all allegiance to Strict Observance, allowing the "eclectic" system of the Illuminati to take its place. Although their hopes of mass recruitment through Freemasonry had been frustrated, the Illuminati continued to recruit well at an individual level. In Bavaria, the succession of Charles Theodore initially led to a liberalisation of attitudes and laws, but the clergy and courtiers, guarding their own power and privilege, persuaded the weak willed monarch to reverse his reforms, and Bavaria's repression of liberal thought returned. This reversal led to a general resentment of the monarch and the church among the educated classes, which provided a perfect recruiting ground for the Illuminati. A number of Freemasons from Prudence lodge, disaffected by the Martinist rites of the Chevaliers Bienfaisants, joined lodge Theodore, who set themselves up in a gardened mansion which contained their library of liberal literature. 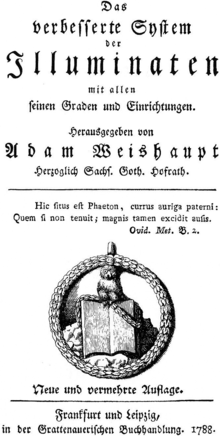 At all costs, Weishaupt wished to keep the existence of the order secret from the Rosicrucians, who already had a considerable foothold in German Freemasonry. While clearly Protestant, the Rosicrucians were anything but anticlerical, pro-monarchic, and held views clearly conflicting with the Illuminati vision of a rationalist state run by philosophers and scientists. The Rosicrucians were not above promoting their own brand of mysticism with fraudulent seances. A conflict became inevitable as the existence of the Illuminati became more evident, and as prominent Rosicrucians, and mystics with Rosicrucian sympathies, were actively recruited by Knigge and other over-enthusiastic helpers. Kolowrat was already a high ranking Rosicrucian, and the mystic Prince Charles of Hesse-Kassel had a very low opinion of the rationalist higher grades of the Illuminati. The Prussian Rosicrucians, under Johann Christoph von Wöllner, began a sustained attack on the Illuminati. Wöllner had a specially engineered room in which he convinced potential patrons of the effectiveness of Rosicrucian "magic", and his order had acquired effective control of the Three Globes and its attached lodges. Through this mouthpiece, the Illuminati were accused of Atheism and revolutionary tendencies. In April 1783 Frederick the Great informed Charles of Hesse that the Berlin lodges had documents belonging to the Minervals or Illuminati which contained appalling material, and asked if he had heard of them. All Berlin masons were now warned against the order, which was now accused of Socinianism, and of using the liberal writings of Voltaire and others, alongside the tolerance of Freemasonry, to undermine all religion. In November 1783 the Three Globes described the Illuminati as a masonic sect which sought to undermine Christianity and turn Freemasonry into a political system. Their final anathema, in November 1784, refused to recognise any Illuminati as Freemasons. The final decline of the Illuminati was brought about by the indiscretions of their own Minervals in Bavaria, and especially in Munich. In spite of efforts by their superiors to curb loose talk, politically dangerous boasts of power and criticism of monarchy caused the "secret" order's existence to become common knowledge, along with the names of many important members. The presence of Illuminati in positions of power now led to some public disquiet. There were Illuminati in many civic and state governing bodies. In spite of their small number, there were claims that success in a legal dispute depended on the litigant's standing with the order. The Illuminati were blamed for several anti-religious publications then appearing in Bavaria. Much of this criticism sprang from vindictiveness and jealousy, but it is clear that many Illuminati court officials gave preferential treatment to their brethren. In Bavaria, the energy of their two members of the Ecclesiastical Council had one of them elected treasurer. Their opposition to Jesuits resulted in the banned order losing key academic and church positions. In Ingolstat, the Jesuit heads of department were replaced by Illuminati. Alarmed, Karl Theodor and his government banned all secret societies including the Illuminati. A government edict dated 2 March 1785 "seems to have been deathblow to the Illuminati in Bavaria". Weishaupt had fled and documents and internal correspondence, seized in 1786 and 1787, were subsequently published by the government in 1787. Von Zwack's home was searched and much of the group's literature was disclosed. Several recent and present-day fraternal organisations claim to be descended from the original Bavarian Illuminati and openly use the name "Illuminati". Some of these groups use a variation on the name "The Illuminati Order" in the name of their own organisations, while others, such as the Ordo Templi Orientis, have "Illuminati" as a level within their organisation's hierarchy. However, there is no evidence that these present-day groups have amassed significant political power or influence, and rather than trying to remain secret, they promote unsubstantiated links to the Bavarian Illuminati as a means of attracting membership. The Illuminati did not long survive their suppression in Bavaria, and their further mischief and plottings in the work of Barruel and Robison must be considered as the invention of the writers. However, writers such as Mark Dice, David Icke, Texe Marrs, Jüri Lina and Morgan Gricar have argued that the Bavarian Illuminati have survived, possibly to this day. Many modern conspiracy theories propose that world events are being controlled and manipulated by a secret society calling itself the Illuminati. Conspiracy theorists have claimed that many notable people were or are members of the Illuminati. Presidents of the United States are a common target for such claims. Other theorists contend that a variety of historical events were orchestrated by the Illuminati, from the Battle of Waterloo, the French Revolution and President John F. Kennedy's assassination to an alleged communist plot to hasten the New World Order by infiltrating the Hollywood film industry. Some conspiracy theorists claim that the Illuminati observe Satanic rituals. The Illuminati, or fictitious modern groups called the Illuminati, play a central role in the plots of many novels, for example The Illuminatus! Trilogy by Robert Shea and Robert Anton Wilson. They also make an appearance in Foucault's Pendulum by Umberto Eco and Angels & Demons by Dan Brown. A mixture of historical fact and established conspiracy theory, or pure fiction, is used to portray them. ^ Jump up to: a b Introvigne, Massimo (2005). "Angels & Demons from the Book to the Movie FAQ - Do the Illuminati Really Exist?". Center for Studies on New Religions. Archived from the original on 27 January 2011. Retrieved 27 January 2011. Jump up ^ Schüttler, Hermann (1991). Die Mitglieder des Illuminatenordens, 1776-1787/93. Munich: Ars Una. pp. 48–9, 62–3, 71, 82. ISBN 3-89391-018-2. Jump up ^ Weishaupt, Adam (1790). Pythagoras oder Betrachtungen über die geheime Welt- und Regierungskunst. Frankfurt and Leipzig. p. 670. Jump up ^ Manfred Agethen, Geheimbund und Utopie. Illuminaten, Freimaurer und deutsche Spätaufklärung, Oldenbourg, Munich, 1987, p150. ^ Jump up to: a b McKeown, Trevor W. (16 February 2009). "A Bavarian Illuminati Primer". Grand Lodge of British Columbia and Yukon A.F. & A.M. Archived from the original on 27 January 2011. Retrieved 27 January 2011. Jump up ^ Roberts, J.M. (1974). The Mythology of Secret Societies. NY: Charles Scribner's Sons. pp. 128–129. ISBN 978-0-684-12904-4. Jump up ^ Simpson, David (1993). Romanticism, Nationalism, and the Revolt Against Theory. University of Chicago Press. ISBN 0-226-75945-8. 88. Jump up ^ Payson, Seth (1802). Proofs of the Real Existence, and Dangerous Tendency, Of Illuminism. Charlestown: Samuel Etheridge. Retrieved 27 January 2011. Jump up ^ Tise, Larry (1998). The American Counterrevolution: A Retreat from Liberty, 1783–1800. Stackpole Books. pp. 351–353. ISBN 978-0811701006. Jump up ^ Jefferson, Thomas (17 November 1802). "'There has been a book written lately by DuMousnier ...'" (PDF) (Letter to Nicolas Gouin Dufief). Retrieved 26 October 2013. Jump up ^ "The Illuminati Order Homepage". Illuminati-order.com. Retrieved 2011-08-06. Jump up ^ "Official website of The Illuminati Order". Illuminati-order.org. Retrieved 2011-08-06. Jump up ^ Sykes, Leslie (17 May 2009). "Angels & Demons Causing Serious Controversy". KFSN-TV/ABC News. Archived from the original on 27 January 2011. Retrieved 27 January 2011. Jump up ^ Barkun, Michael (2003). A Culture of Conspiracy: Apocalyptic Visions in Contemporary America. Comparative Studies in Religion and Society. Berkeley, CA: University of California Press. ISBN 978-0-520-23805-3. Jump up ^ Penre, Wes (26 September 2009). "The Secret Order of the Illuminati (A Brief History of the Shadow Government)". Illuminati News. Archived from the original on 28 January 2011. Retrieved 28 January 2011. Jump up ^ Howard, Robert (28 September 2001). "United States Presidents and The Illuminati / Masonic Power Structure". Hard Truth/Wake Up America. Archived from the original on 28 January 2011. Retrieved 28 January 2011. Jump up ^ "The Barack Obama Illuminati Connection". The Best of Rush Limbaugh Featured Sites. 1 August 2009. Archived from the original on 28 January 2011. Retrieved 28 January 2011. Jump up ^ Read, Max (February 28, 2012). "A Comprehensive Guide to the Illuminati, the Conspiracy Theory That Connects Jay-Z and Queen Elizabeth". Gawker. Gordon, Alexander (1911). "Illuminati". In Hugh Chisholm. Encyclopædia Britannica 14 (11 ed.). NY: Encyclopædia Britannica, Inc. Retrieved 2011-01-27. Markner, Reinhold; Neugebauer-Wölk, Monika; Schüttler, Hermann, eds. (2005). Die Korrespondenz des Illuminatenordens. Bd. 1, 1776–81 (in German). Tübingen: Max Niemeyer. ISBN 3-484-10881-9. Melanson, Terry (2009). Perfectibilists: The 18th Century Bavarian Order of the Illuminati. Walterville, Oregon: Trine Day. ISBN 9780977795383. OCLC 182733051. Utt, Walter C. (1979). "Illuminating the Illuminati" (PDF). Liberty (Washington, D. C.: Review and Herald Publishing Association) 74 (3, May–June): 16–19, 26–28. Retrieved June 24, 2011. Burns, James; Utt, Walter C. (1980). "Further Illumination: Burns Challenges Utt and Utt Responds" (PDF). Liberty (Washington, D.C.: Review and Herald Publishing Association) 75 (2, March–April): 21–23. Retrieved June 25, 2011. Gruber, Hermann (1910). "Illuminati". The Catholic Encyclopedia 7. NY: Robert Appleton Company. pp. 661–663. Retrieved 2011-01-28. Melanson, Terry (5 August 2005). "Illuminati Conspiracy Part One: A Precise Exegesis on the Available Evidence". Conspiracy Archive. Archived from the original on 28 January 2010. Retrieved 28 January 2010.